Great results featuring a key benefit of adult braces. Straight teeth quickly handling sever crowding and rotations in 6 months. Crowded bottom teeth get worn down quickly at odd angles. Prevention of tooth wear by straightening the teeth is important. In this patient, we used adult braces to quickly straighten the teeth that already had worn down, then used dental bonding to correct the wear. The results show whiter brighter straight teeth with braces and bonding on the lower four front teeth. This type of dentistry prevents the need to get more expensive and invasive dental treatments like dental crowns. We can completely change your life in six months, between your next two dental cleanings. Smile Stylists offer short term orthodontics, six month smiles, speed braces or adult braces as a definitive treatment option to correct bad bites, tooth wearing, crowded crooked teeth, spacing and other dental issues. Smile Stylists also offer short term orthodontics, six months smiles, as adjunct treatments for ultra conservative minimal and no preparation veneers. 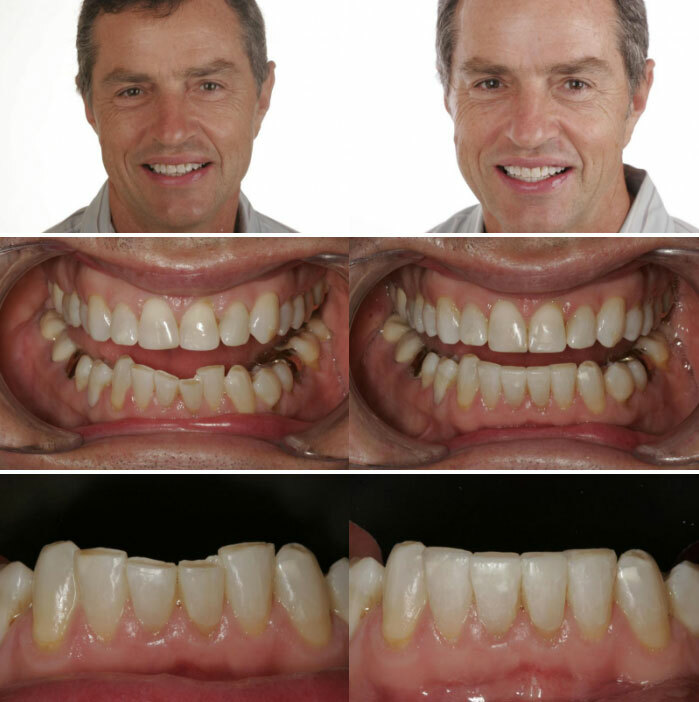 Moving teeth into the ideal positions to provide natural looking and health veneers with out preparing teeth or drilling teeth. Six months smiles or short term braces is a fantastic way to get straight teeth and a healthier mouth. Many people are turned off by traditional orthodontics or traditional braces. The idea of an adult wearing braces for two years is discouraging. The idea of wearing braces for 6 months and having beautiful smiles is much more alluring. To know that specific cosmetic tooth enhancements can be made in as few as six months or even shorter treatment times is much easier to accept. Six Month Smiles is faster braces, because it focuses on patients chief complains about their smiles. Chief complaints like; crooked front teeth, rotated front teeth, spaces between teeth and dental over bites. By focusing on the front teeth, patients can have straight teeth in about six months. The goal of comprehensive orthodontics is to create ideal occlusions as well as straighten the front teeth improving the smile. This leads to longer treatment times. We frequently hear stories from patients who have a specific concern about a rotated front tooth or one crooked tooth come to us for a second option other than 2 years of braces. Imagine having one tooth that is crooked and needing to wear braces for two years to improve the smile. By targeting specific concerns and goals of our patients, smiles are fixed in six months! The other alternative for many of these patients is to do nothing and live with the smile that is hurting their self confidence. Six Month Smiles is the ideal option for adult braces. We only consider adults for short term braces, so it is considered an adult braces treatment. Most children are referred to orthodontists for comprehensive orthodontics which typically takes 2 years. Adult braces is problem focused and deals mainly with the adults chief complaint, which is normally crowding or spacing of the front teeth that are apparent when the adult considering braces smiles. Six Month Smiles and other short term braces offered by Smile Stylist dentists comes with your choice of retainers, clear aligners or fixed retainers after treatment. The brackets and wires are tooth colored for minimal display during smiling. We provide payment plans for patients allowing them the ability to break up payments with minimal money down at the records appointment. We also offer care credit options for all cosmetic dentistry services. We offer all options for patients who want to improve their smiles from no preparation porcelain veneers, implant retained cosmetic dentures to snap on smiles, Invisalign and even traditional braces with six month smiles. Your Smile Stylist should be proficient at all options to improve smiles to give you a non biased opinion on how to get a beautiful smile. Frequently asked questions about six month smiles. If it only takes six months, instead of two years, does that mean it is going to hurt more? No, adult speed braces does not hurt more than regular comprehensive orthodontics. Patients are usually the most sore for the first month while getting used to wearing the braces. Adult cosmetic braces works by applying light forces on the teeth for a shorter amount of time than traditional braces, so there is no more discomfort than traditional braces. What will the braces look like? Six Month Smiles uses clear braces and tooth colored wires. They are difficult to see at a speaking distance. They are not the traditional metal braces and wires worn by Ugly Betty. 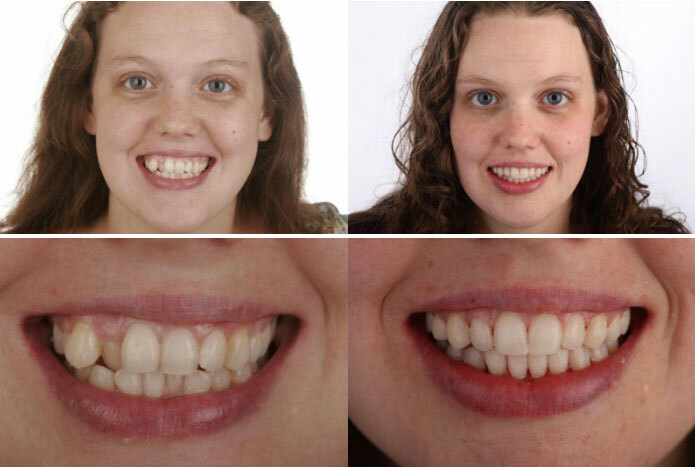 We have pictures of what the braces look like on patients and can show you what they look like on models. Here is a picture of a patient wearing our clear braces and tooth colored wires. Do short term braces really only take six months to straighten crooked teeth? The average treatment time for adult orthodontics is six months. Cases will take anywhere from 5 months to 9 months depending on several factors. We can give you a good estimate at your free consultation. I heard that moving teeth too fast is bad for your teeth. Is that true? Heavy forces applied to teeth over a long period of time have the most potential to cause complications with the teeth. Six Month Smiles uses light forces applied over short periods of time, so it is just as safe or safer for your teeth than traditional braces. So why wouldn’t I just get Invisalign and use the clear retainers to straighten my teeth? There are several reasons why wearing braces as an adult can be better than clear aligners like Invisalign. First of all, braces can move your teeth 2-3 times faster than aligners. Typical cases that take 9 months with Invisalign will only take 6 months with braces. Second of all, the price is lower for braces than Invisalign. Shorter treatment times and less hefty fees for the aligners mean that the cost can be lower for the adult considering straightening teeth. Third of all, and most importantly, the dentist may choose to use braces for movements that are less predictable with aligners. Rotated teeth and teeth that require extrusion or being pulled down are problematic for aligners and create problems during treatment. These teeth are treated predictably with braces. There is also more control for dentists during treatment when using braces. If changes need to be made to tooth movements while wearing aligners, new impressions of the teeth need to be made and sent away to have more trays made by Invisalign. This is time consuming and present lengthy delays and frustrations. Because Smile Stylists offer both Invisalign and adult braces options, they can give you a very unbiased opinion as to which system will work best for each patient. Schedule a free consultation to find out all your options to get straight teeth.